Multi-platinum international superstar Luis Fonsi, Coach of Telemundo’s first season of "LA VOZ" (The Voice), will be featured on NBC’s “Today” (7-10 a.m. ET) and “The Tonight Show Starring Jimmy Fallon” (11:35 p.m. ET), this January 30, 2019. The award-winning music megastar will talk about his music career and his participation in the U.S. Spanish-language version of NBC’S hit singing competition “The Voice,” airing on Telemundo Sundays at 9 p.m. ET. Fonsi will also perform his latest hit “Imposible” on "The Tonight Show Starring Jimmy Fallon." With numerous awards and unprecedented achievements, Luis Fonsi continues to break world records, cross borders and make history with his music. Also in 2018, the Puerto Rican singer and songwriter won seven Billboard Latin Music Awards and five Latin Grammy Awards. In addition to his commitment as the spokesperson for St. Jude Children Hospital’s “Thanks and Giving” campaign, Fonsi is an ambassador of Puerto Rico’s Tourism and is the founder of Luis Fonsi Foundation to help victims of Hurricane Maria. 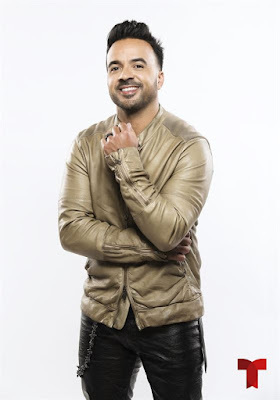 Telemundo’s "LA VOZ" (The Voice), hosted by renowned TV personality Jorge Bernal, features award-winning Latinx music megastar Luis Fonsi, Alejandra Guzmán, Carlos Vives and Wisin, as Coaches of the first-ever Spanish-language edition for the U.S. to discover some of the most promising Spanish-speaking vocalists in the nation.